The engine should be at normal operating temperature for all tests. Locate the self test connectors on the drivers side inner fender well. You can find these, by finding the one which looks similar to the shape of a house. Hook up with a jumper wire as shown in the diagram below. Turn your key forward to the RUN position (KOEO, key on, engine off), and wait for the codes. Codes will flash out on the CHECK ENGINE or SERVICE ENGINE SOON light. If you have hooked up a voltmeter, the needle on the voltmeter will indicate the digits of the trouble codes in sweeps of the needle. Record all codes and identify them as KOEO codes. Each number will be shown in blinks of the light or sweeps of the needle. For example: 2 quick flashes, two second pause, 3 quick flashes indicate code 23. Three digit codes will be displayed in the same manner with an extra 2 second pause then the third digit. If more than one code is stored, there will be a 4 second pause between the next code. After the KOEO codes are displayed, the continuous codes will be displayed. Continuous codes follow the last KOEO code after a 6 to 9 second pause, a quick flash, and another 6 to 9 second pause. Record these codes as continuous codes. Turn key off and remove the jumper wire. Last you will perform an engine running test. Start the engine and run at 2000 RPM for two minutes to warm sensors. Turn off engine and wait 10 seconds. Install jumper wire, start the engine and let it idle. Watch for the engine identification code. It will be 3 flashes for a six cylinder and 4 flashes for an 8 cylinder. If your vehicle is equipped with the E4OD transmission, press and release the brake pedal immediately after the ID code. This tests the brake on/off switch. If your vehicle is equipped with a power steering pressure sensor (4.9 and 5.0 '87-'90 and '93 5.0 without E4OD) turn the steering wheel at least a half turn and return immediately after the ID code (or after the brake test). Next, watch for a single quick flash. If it occurs, floor the gas pedal and release quickly to perform a wide open throttle test. NOTE: Do not perform the wide open throttle test unless indicated to do so, as not all models use this test. Now the codes will be displayed. Record and identify these codes as engine running codes. After the codes are displayed, turn off the engine and remove the jumper wire. To clear codes, during the KOEO test remove the jumper wire before all codes are displayed. Or as an alternate method you may disconnect the battery to clear them. Disconnecting the battery will cause the loss of the computer memory that adapts to your driving style, so this method will cause a different running condition until the computer relearns your driving style. This isn't a big deal, most people clear codes by disconnecting the battery. It is important to remember to clear codes any time work has been done so old codes aren't present. I have added this picture because there are a few people who have said they can't see the diagram. 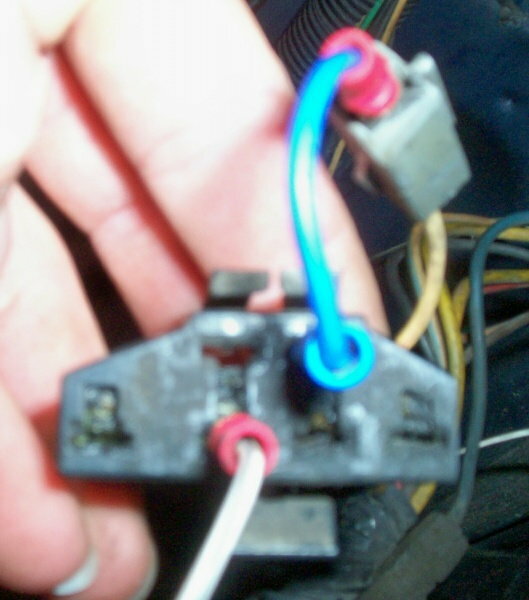 You can see the two connectors jumped together with the blue wire. The white wire will be the voltmeter negative lead and the voltmeter positive will go to the battery positive. 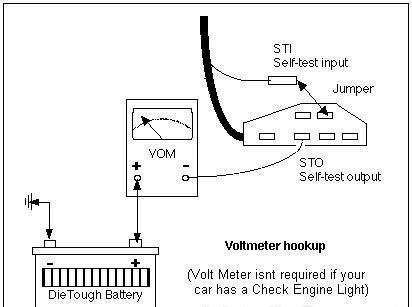 You don't need to hook up a voltmeter if your vehicle has a check engine light in the dash. NOTE- A volt meter is NOT required when you have a good CEL bulb. Last edited by ymeski56; 09-18-2012 at 08:47 PM. JCMS, what year vehicles will this work on? I think this is very useful info as I recently paid someone to get the codes from my '01 F150 truck. This works for any Ford OBDI system, which is up to '95. Hey Sean, the hook up shown looks the same as the EEC-IV. Will the EEC-IV tester work on OBD-I? is the diagram not working for anyone other than me?